Today we will be checking out a ceratopsian dinosaur that may have used its frill to attract potential mates. Check out Mojoceratops perifania! Mojoceratops was a plant-eater that lived in what is now Canada, during the late Cretaceous, between 76.5 and 75 million years ago. From beak to tail, Mojoceratops was about fifteen feet long. Its genus name translates to "Mojo horned face" and the species name, perifania, is Greek for "pride". In the early 1900s, mojos, were trinkets that were said to grant their owners with being more sexually attractive to others. Both parts of the name reference this dinosaur's large frill, which may have been a display adaptation in life, possibly for attracting mates. Mojoceratops life reconstruction by Christopher DiPiazza. These dinosaurs, like the rest of their kin, probably used their frills as display adaptations to impress or intimidate each other. 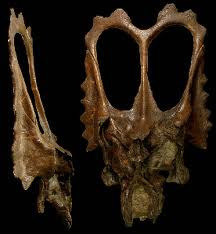 Partial skull, including the frill, from Mojoceratops. Note the heart shape on the top. This specimen has since been assigned to Chasmosaurus russelli. 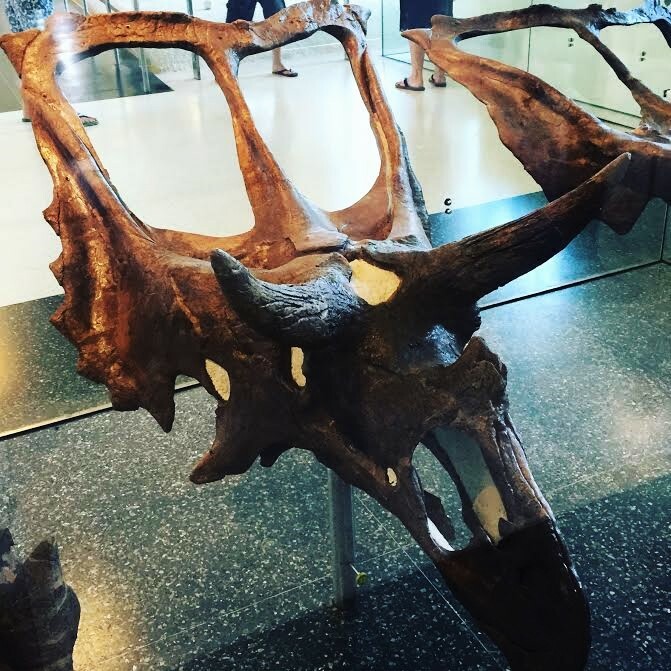 In addition to the tall frill, which had a dip in the middle, making it almost heart-shaped, Mojoceratops also possessed three horns on its face. The two over each eye were relatively long, thin, and angled upwards and slightly to the sides. The nose horn was actually pretty flat laterally, and almost rectangular. Like the frill, these horns were likely display adaptations. 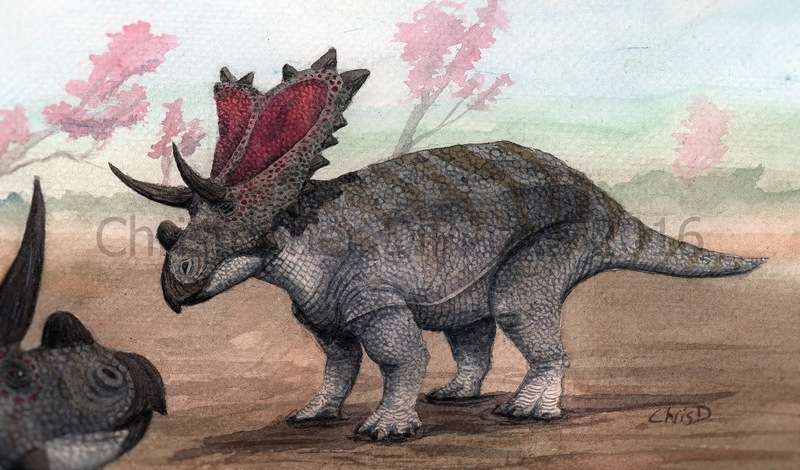 They may have also helped Mojoceratops defend itself from predators if it had to. Mojoceratops skull on display at the American Museum of Natural History in New York. When it was first erected it was labelled as a species of Chasmosaurus and the label was never changed. Now it's been re-reassigned to Chasmosaurus again so extra work averted! The back part of this specimen's frill was never found and was reconstructed to match other known Chasmosaurus material. Like all ceratopsians, Mojoceratops had a curved beak that was ideal for clipping vegetation which would then be shredded up by batteries of small teeth in the back of the mouth. There are some who hypothesize that ceratopsians were omnivores, using their beaks and teeth to eat meat as well, but there is no evidence that suggests this on the fossil record thus far. Since occasional meat consumption can be seen in modern animals that are typically herbivorous it probably isn't out of the realm of possibility, but it is completely unknown if ceratopsians were exhibiting this feeding hebavior regularly. Nicholas R. Longrich (2010). "Mojoceratops perifania, A New Chasmosaurine Ceratopsid from the Late Campanian of Western Canada". Journal of Paleontology 84 (4): 681–694.